This summer we called on drum corps fans to "spread the word" about drum corps to the uninitiated - invited longtime fans to become marching music evangelists. Jim Johnson of Ellettsville, Ind., sent in this one. "I've been involved with the Colts for 17 years, starting as a marching member and currently serving as a volunteer. My partner Barry Magee has also been volunteering with the corps for ten years. 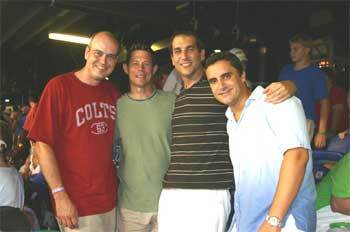 In 1994 I took our friend Dean Custer, then a Boston resident, to the DCI Championship Finals in Foxboro. He was hooked, of course, and later attended several big regional and championship events. "We were disappointed when Dean moved to Spain a year ago, but we were pleased to learn that he would be back in the States in August this year. We started making plans in December to meet for finals. Dean wasn't traveling alone; he brought Antonio all the way from Toledo, Spain, for the event. In spite of the unbearable heat that night, Antonio was impressed with the corps' performances. He may not make it back for a DCI show every summer, but I believe he returned home a fan of the activity. "This is a picture of the four of us at finals: (From the left) me, Barry, Dean and Antonio." Thanks Jim! We realize the summer is over, but if you brought a "new" drum corps friend to a DCI show this past summer, send us a pic and we'll acknowledge you! But then this winter, you've got to promise to keep those drum corps passions burning, and inspire your new converts to bring friends to DCI shows next summer!